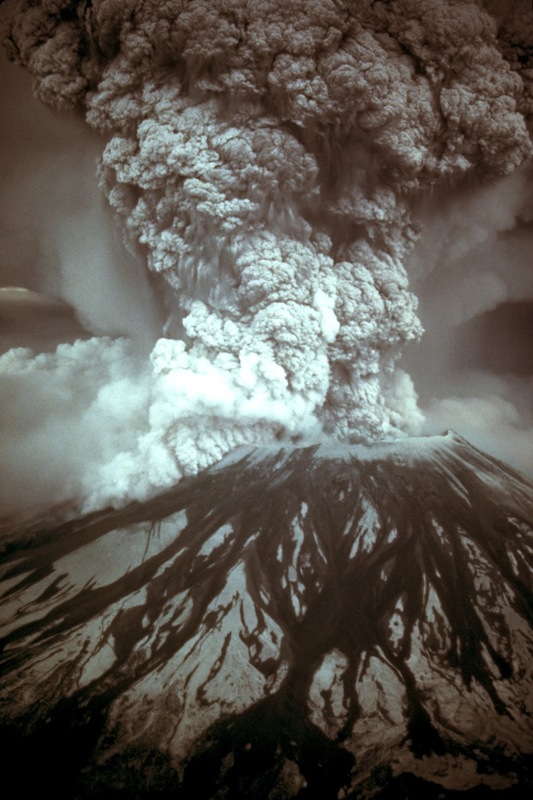 On May 18, 1980, a major volcanic eruption occurred at Mount St. Helens, a volcano located in Skamania County, in the State of Washington. It has often been declared as the most disastrous volcanic eruption in U.S. history. The eruption was preceded by a two-month series of earthquakes and steam-venting episodes, caused by an injection of magma at shallow depth below the volcano that created a large bulge and a fracture system on the mountain’s north slope. On May 18, 1980, at 8:32 a.m. Pacific Daylight Time, a magnitude 5.1 earthquake shook Mount St. Helens. The bulge and surrounding area slid away in a gigantic rockslide and debris avalanche, releasing pressure, and triggering a major pumice and ash eruption of the volcano. Thirteen-hundred feet (400 meters) of the peak collapsed or blew outwards. As a result, 24 square miles (62 square kilometers) of valley was filled by a debris avalanche, 250 square miles (650 square kilometers) of recreation, timber, and private lands were damaged by a lateral blast, and an estimated 200 million cubic yards (150 million cubic meters) of material was deposited directly by lahars (volcanic mudflows) into the river channels. Fifty-seven people were killed or are still missing. USGS Photograph taken on May 18, 1980, by Austin Post. 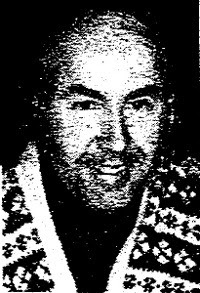 Robert Emerson Landsburg (November 13, 1931 – May 18, 1980) was an American photographer who was killed while photographing the 1980 eruption of Mount St. Helens. 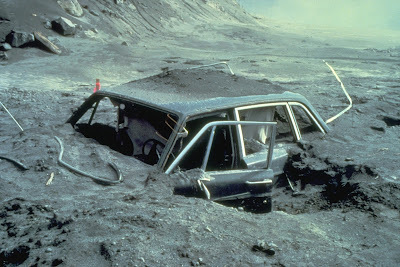 Car after Mount St. Helens 1980 Eruption. Reid Blackburn’s (photographer, National Geographic, Vancouver Columbian) car, about 10 miles from Mount St. Helens.